In my next to last post, I discussed some of the anecdotal reports of den collapses included in the peer-reviewed summary of facts presented by biologists Ian Stirling and Andrew Derocher (2012) that supposedly support the premise that global warming is already having an impact on polar bear populations (discussed previously here, here, and here), prophesied to be even greater in the future. While they admit that such reports are not based on scientific studies, they nevertheless include them in their published list of global warming impacts, and not surprisingly, that is how others have interpreted them. Were these observations of cannibalism made by polar bear researchers or someone else? Were there as many observers in the area in each of the five years prior to the year they occurred, as there were when these incidents were observed? We don’t know, because it’s unpublished data. In this post, I take a look at some of the evidence that is published, some of the media interviews and reports that followed, and the information that came from a press release issued by an advocate group. I’ve made a table summarizing the details of all recent papers and reported incidents, and some of them are described in more detail. In a footnote, I have a brief summary of why polar bears kill and eat each other. These details reveal some rather shocking evidence of scientists misrepresenting evidence – in their peer-reviewed papers and in interviews with the media – and bathing their global warming prophesies in the blood-lust of cannibalism. It’s past time to shine a big bright light on the cannibal issue, so pardon the length of this post. Figure 1. 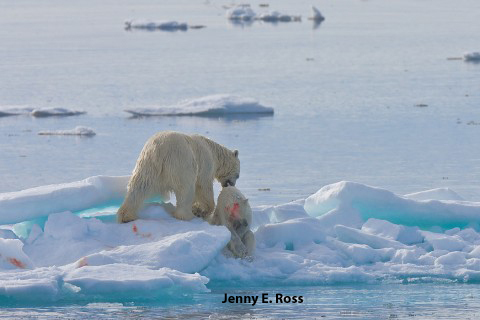 A male polar bear found eating a younger, smaller bear in Svalbard (Barents Sea) and captured on film by Jenny E. Ross, photo journalist. This photo accompanied a National Geographic article by Ross published online January 10, 2012 (this photo also appeared in Stirling and Ross, 2011). This bear is in good condition – one other in the Stirling and Ross paper was described as “very large and very fat.” All were observed on ice, from ships, and all were photographed. Figure 2. A large male bear with the remains of a cub he stole from a female, killed, and ate near Churchill on November 20, 2009 and witnessed by tourists on a tundra buggy (taken by professional photographer Daniel J. Cox, Natural Exposures.com). Notice that while this bear is on the lean side, he is not skin-and-bones: it was never claimed that he was “starving.” From a CBC (Canada) news report on Dec. 3, 2009, discussed in detail below, just days after Polar Bears International issued a press release about this incident, with photos and video taken by Cox. The 2010 could be a typo – except that it conveniently makes the incidents appear to be more recent and implies that they did not occur during a year (2009) when there was much more ice on Hudson Bay than usual (and bears were in better-than-average condition – more on this below). The second highlighted passage could just be bad writing – except that it conveniently underestimates the number of previous cannibalism incidents by a huge amount. 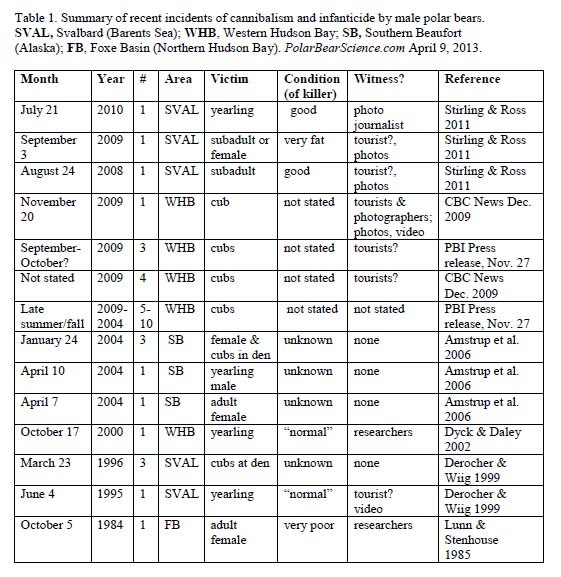 Saying that one or two incidents occurred over the last 5 years (1 or 2 total) when in fact there had been one or two each year over the last 5 years (5 to 10 total) (see discussion below, in the media section) is a big difference and sounds much more like a meaningful increase. And in one of the sentences just prior to that one (see quote in the introduction), only one of the four publications they cite to support their statement of past reports of cannibalism by thin adult males actually reports cannibalism by a male in very poor condition – another blatant misrepresentation. That’s three misrepresentations of fact, in one paragraph. So, there seemed no way to blame these Svalbard incidents of cannibalism on bears that were starving due to global warming. Seriously? Because none of them have seen this before – with their very own eyes – it must be an extraordinary event? They make a big deal out of a male killing a female in a maternity den in January, as if this is somehow materially different than the killing of the other female a day or so after she’d emerged from her den in April. But most importantly, in all three cases, they discovered the carcasses of the killed bears after the fact: both females had been only partially eaten while the third (the young male) had been mostly eaten. The researchers had little information on who killed these bears, except for bite marks and associated tracks – they certainly did not know whether the attacking bears were thin or fat. Wait a minute! The sea ice in April (when 3 out of 4 of their kills were made) is close to its maximum extent and fat baby ringed seals are usually abundant – except when the shorefast ice is very thick (see previous post here). Why were polar bears starving in the spring? 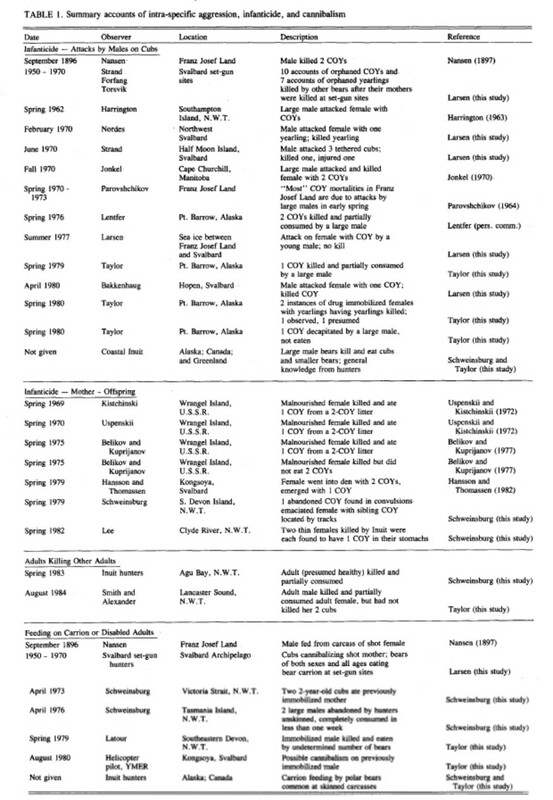 The last time biologists saw starving bears in spring (1974) it was a heavy ice year. Was 2004 an especially heavy ice year? Heavy ice years occurred previously in that same area in 1964, 1974 & 1975, 1984 & 1985, and 1992 – 2004 would have been right on schedule. I’m speculating – surely if this had been the case, we would have heard about it? 4. For details of other recent incidents, see Table 1 below. Table 2 is from Taylor et al. (1985), which describes the known incidents of cannibalism, infanticide and intraspecific aggression to that date (apologies for the poor quality). It is clear from Taylor et al.’s list that cannibalism has taken place relatively often in the past – in spring, summer and fall – long before ‘global warming’ reared its ugly head as a potential scapegoat. From: Taylor, M., Larsen, T. and Schweinsburg, R.E. 1985. Observations of intraspecific aggression and cannibalism in polar bears (Ursus maritimus). Arctic 38:303-309. Click to enlarge. OK, we’ve seen what’s been said in a few of the peer-reviewed papers. But what have journalists, polar bear researchers and conservation advocates done with these anecdotal observations consistent with predictions of the effects of climate warming in the media reports? There are lots of examples, but two will suffice. 1. Are polar bears victims of the new cold war? Climate change may be affecting the bears’ habitat. Emily V. Driscoll, February 5, 2007 [regarding the Amstrup et al. 2006 paper] backup here. The first time scientists observed polar bear starvation? Really? See previous post here about the mortality events of 1974-75 in the eastern Beaufort and the quote from Stirling and Lunn (1997) about starving females and cubs in the spring of 1974 – more than the two Amstrup found, by my count. But I guess they didn’t do a bone marrow test back in 1974, so it doesn’t count as “documented.” Note, from the discussion of the actual paper (Amstrup et al. 2006) above, that the starving bears he is talking about in this interview are not the bears who cannibalized other bears! He does not know anything about the condition of the bears that killed other bears because no one witnessed the killings – they just found carcasses after the fact. The late formation of Arctic sea ice may be forcing some hungry and desperate polar bears in northern Manitoba to resort to cannibalism. Eight cases of mature male polar bears eating bear cubs have been reported this year among the animals around Churchill, according to scientists. Four cases were reported to Manitoba Conservation and four to Environment Canada. Some tourists on a tundra buggy tour of the Churchill wildlife management area on Nov. 20 were shaken and started crying after witnessing a male bear eating a cub, said John Gunter, general manager for Frontiers North Adventures, an area tour operator. In recent years, Manitoba Conservation has received one to two reports each year about bear cannibalism. Retired Environment Canada biologist Ian Stirling, who has studied bears all over the arctic, said evidence suggests the cubs are being killed for food, not just so the male can mate with the sow. The Hudson Bay sea ice, which the bears use to get at the seals they need to fatten up for winter, isn’t appearing until weeks later than it used to, he said. Killing of a cub for food by an adult male has also been recorded in Svalbard, in the Norwegian Arctic, said Stirling. And in the southern Beaufort Sea, where the body condition of polar bears has also declined apparently because of deteriorating ice conditions, there have been four cases of cannibalism by adult male bears in the last few years. 5) The bear pictured was not starving (thin), although he was on the lean side and undoubtedly hungry. If he’d been in starvation condition, it would have been in the headline. 6) Professional photographer Daniel J. Cox just happened to be around to witness the Nov. 20th event and capture photos and video to release to the media. He is a member of the ‘Advisory Council’ of Polar Bears International (two photos accompanied this article and he made video for the TV news outlets), see CBC Manitoba News Reports on polar bear cannibalism(interview with Ian Stirling 2008, on video) and CBC National News Polar bear cannibalism near Churchill(interviews with photographer Daniel J. Cox and Ian Stirling, on video); 6) It appears that the media knew about these events because Polar Bears International issued a press release on November 27 (pdf here), with helpful quotes from Ian Stirling. It seems there were at least two professional photographers around Churchill back in November 2009. In addition to Cox, a photographer by the name of Iain D. Williams (Reuters) was there on November 20 as well, which we know because several of his photos appeared in a Daily Mail (UK) story on Dec. 8 (here) and in the National Post (Canada) the next day (here). Interestingly, the National Post story (“Climate change not to blame for polar bear cannibalism”) was the only one that really provided some perspective on the issue, rather than glorifying the emotional impact of the pictures (they used just one, not several). Mr. Pinksen [director of policy and legislation for Nunavut’s Department of Environment], meanwhile, said more attacks on cubs are likely witnessed in Churchill because the polar bear population is dense due to ice not forming on Hudson’s Bay, leaving more chance of tourists seeing bear cannibalism. The ice was late forming that year, by a couple of weeks, but it was also several weeks late breaking up, resulting in bears that started the onshore season in very good condition (see news reports here and here and discussed in previous post here. Really? The press release from PBI (pdf here), with quotes from government officials, clearly says they had one or two reports of cannibalism every year. Stirling just can’t seem to get this right, see the conclusions about the Stirling and Derocher (2012) paper. By including anecdotal reports of cannibalism (the most critical of these being unpublished reports) in their summary of facts supporting impacts of global warming on polar bears that are already being felt, Stirling and Derocher (2012) imply that it is scientifically valid to over-ride the ‘not statistically significant’ assessment of the correlation because they believe otherwise. How can these anecdotal incidents possibly be interpreted as observations consistent with predictions of the effects of ‘climate warming’? The only observation known for a fact to have involved a cannibal bear in poor condition (starving), in the fall (when the ice was low), occurred in 1984. None of the recent incidents included documented evidence of starving bears and several were in good condition. The eight incidents purported to represent an increase in cannibalism all occurred in a year when Hudson Bay had much more ice than usual (so that bears came ashore at least two weeks later, in better than average condition) – the fact that the ice was a few weeks later than usual re-forming in the fall was partially offset by the late breakup date that summer. Significantly, there have been no media reports or peer-reviewed papers documenting any more cannibalism events in western Hudson Bay since 2009. Stirling, Derocher and Amstrup suggest there is an increase in cannibalism that correlates with reduced sea ice and nutritionally stressed bears – I say their argument is full of hot air. The reason we go to all the trouble to do properly designed scientific studies is because anecdotal observations are not scientifically useful. Any apparent increase in cannibalism might easily be explained by ‘more eyes’ – more rich tourists, more eager photographers, people out and about where polar bears congregate in high numbers. A properly designed study would tell us whether that was the case – but Stirling, Derocher and Amstrup prefer their anecdotes and prophesies of a doomed future for polar bears. Who is providing the spin here – is it the media’s fault (see previous post here)? No, it is the polar bear scientists who are misrepresenting the information in these cases. They blatantly infer that all cases of cannibalism they refer to involve starving bears killing and eating other bears – when they know for a fact that is not the case. They not only do this in interviews, but in their scientific papers as well! FOOTNOTE: Why do polar bears kill and eat each other? Amstrup, S.C., Stirling, I., Smith, T.S., Perham, C. and Thiemann, B.W. 2006. Recent observations of intraspecific predation and cannibalism among polar bears in the Southern Beaufort Sea. Polar Biology 29, no. 11:997–1002. Accepted 27 March 2006. Pdf here. Derocher, A.E. and Wiig, Ø. 1999. Infanticide and cannibalism of juvenile polar bears (Ursus maritimus) in Svalbard. Arctic 52:307-310. Dyck, M.G. and Daley, K.J. 2002. 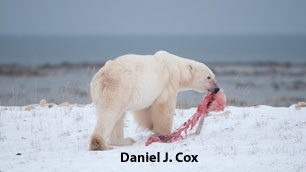 Cannibalism of a yearling polar bear (Ursus maritimus) at Churchill, Canada. Arctic 55:190-192. Gagnon, A.S. and Gough, W.A. 2005. Trends in the dates of ice freeze-up and breakup over Hudson Bay, Canada. Arctic 58:370-382. Larsen, T. 1985. Polar bear denning and cub production in Svalbard, Norway. Journal of Wildlife Management 49: 320-326. Lunn, N.J. and Stenhouse, G.B. 1985. An observation of possible cannibalism by polar bears (Ursus maritimus). Canadian Journal of Zoology 63:1516-1517. This entry was posted in Advocacy, Cannibalism, Life History and tagged adult males, Amstrup, anecdotal observations, Beaufort, body condition, cannibalism, Daniel J. Cox, Derocher, Hudson Bay, Hudson Bay freeze-up, infanticide, intraspecific aggression, Jenny Ross, Polar Bears International, Stirling, Svalbard. Bookmark the permalink.